Here is my entry for the DCM Daily Challenge. Anything Goes! Anything goes with your favourite technique. This is a 5x5 piece of blue cardstock, stamped with decorative circles using Versamark and dusted with gold embossing powder. After heat setting the embossing powder I then rubbed some bright red and green ink over the card in random stripes and then buffed the ink off of the circles with kitchen paper. Some brown ink to follow and then some roughing up with course sandpaper. I was aiming for a 'weathered paint' look. The blue card was matted on to an old torn page and then on to a cream background. This was chosen as the winner for yesterdays challenge: not at all bad for a Monday! 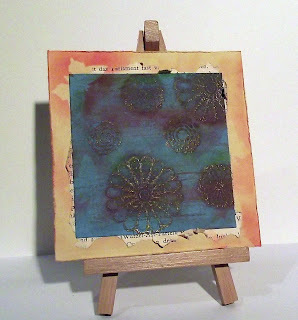 I'm off now to make some ATCs for the this months swap. Have a good day.